Portescap introduces the 22NT Athlonix Brush DC Miniature motor. The new motors offer good power-to-weight ratio, ensuring high battery life while providing high power up to 12.7W. This enables OEMs to build smaller, lighter, and higher performing machines and devices. This robust motor eliminates the need to choose between compact size and weight or battery life and equipment life cycle. The mini motors provide high continuous torque up to 16.6 mNm to deliver higher endurance and performance while maintaining operational efficiency. The product is a motor, weighing just 54 g / 1.90 oz. As part of the Athlonix platform, the motors feature an energy efficient coreless design with an optimized self-supporting coil, magnetic circuit along with Graphite commutation system. This allows for the motor to maximize power density, while also providing sustained endurance over the life of the motor. This makes the miniature motors suited for use in applications such as Humanoid Robots, Medical and Industrial Hand Tools, Miniature Pumps, Lab Automation, Clinical Diagnostics and Material Handling. 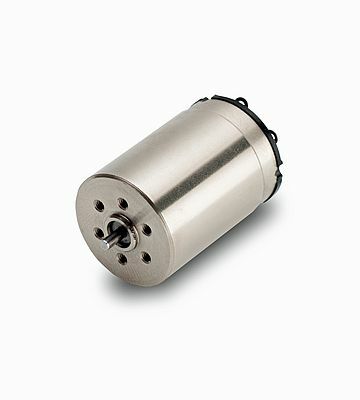 The mini motors are compatible with incremental encoders and gearheads of various sizes and ratios and can be customized to meet customers requirement (Ball Bearings, Shaft Length, Special Coils, Cable Connectors, Fixation Holes).